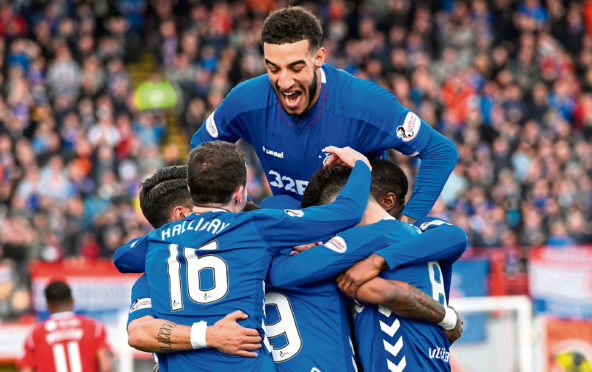 Connor Goldson is relishing the prospect of another battle against Aberdeen at Pittodrie today. He’s delighted that Rangers will have one of Scottish football’s most-talked-about players in their ranks. Alfredo Morelos is also, according to the defender, one of the most changed men at Ibrox. It’s too early to say if the Colombian has mended his ways when it comes to discipline, but Goldson says he now has his physical preparation spot on. That’s one reason why he’s already hit the net 28 times this season, compared to 18 last term. Goldson said: “When I first came to the club, you could see he’d had a good summer. “But, to be fair to him, he worked his socks off and got rid of a lot of weight. “The work he’s now able to do in a game of football is incredible – that’s the difference for me. “He’s a player that works his socks off for 90 minutes for the team. “He’s done that for 41 games, which is credit to the way he has looked after himself and the player he’s made himself into. “I wouldn’t say he’s getting stronger. He’s naturally a strong boy. “He’s not in the gym lifting weights all the time, it’s just natural. “You look at the size of his legs, his bum, it’s huge. “He has the frame of a grown man, even though he’s just turned 22. “Do I think he’s the best player in Scotland this season? Yeah, his record speaks for itself. The last time Rangers travelled to Pittodrie, they left with a victory but also ended up losing Morelos for three games following a controversial red card when he clashed with Scott McKenna. There’s a chance the Aberdeen players will do their best to test the temperament of Morelos in today’s Scottish Cup clash. Goldson is reluctant to call for his team-mate to stay completely calm. The former Brighton stopper reckons that the fire within the Colombian is why he’s such a matchwinner. He went on: “We know they are going to try to wind up certain individuals. “We need to be man enough not to do anything back and keep the head. “Alfredo is one of the players who you don’t really want to take anything away from the way that he plays. “It’s the way he’s been brought up. If you take that away, he won’t be the player that he is. “He’s had some silly moments over the season, but we are never going to hammer Alfredo when he’s won us more points than he’s lost. Not everyone who comes from England is impressed with the grounds they have to visit this side of the border. That’s especially true of those who have experienced the glitz and glamour of multi-million pound grounds in the Premier League. Goldson, however, can’t get enough of going to places like Pittodrie. He went on: “I’ve played in every league in England, and I prefer the away games when you go to a bit of an atmosphere. “In this league there are lots of away games where we have more fans than the home team.That is a bit strange. “But away games are brilliant when you’re going into a good stadium where the home fans are right behind their team. “In England, Hillsborough was a brilliant place to go in the play-offs. “We also went to Middlesbrough for the last game of the season where both teams could have gone up. The atmosphere was amazing. “The Premier League was different. “When Brighton came to town, it wasn’t exactly everyone’s biggest game, although the Palace one was usually good. “In this league, it’s competitive and when we come to town everyone wants to beat us.